The Reasons You Need To Earn Extra Income - It Can Change Your Life! Here on Making Sense of Cents, I talk a lot about how to earn extra income. I believe that earning extra income can completely change your life too. 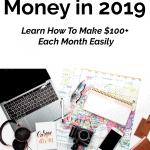 You can stop living paycheck to paycheck, you can pay off your debt, and more- all by learning about the many different ways to make money. However, not many people have side jobs, and some don't see the point in finding ways to make extra income. Some think that it's impossible. Well, I'm here to tell you that it is possible, and learning how to make extra money can change your life! Sure, it may be hard at first, but once you reach your goal you’ll know that it was well worth it. Learning how to make extra money is how I was able to pay off my student loans in just 7 months, plus it gave me the freedom to leave my day job in order to pursue my passion, travel full-time, and more! Finding ways to earn extra income completely changed my life for the better, and this is why I think more people need to learn how to make more money in new ways. Save for big purchases, such as a vacation. Stop living paycheck to paycheck. Help you reach retirement sooner. Figure out a business idea. Become more diversified with your income streams. While cutting your budget is great and all, making more money is great too. It allows you to save more money because you can only cut your budget by so much. Your income, on the other hand, can grow by an endless amount. 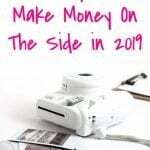 Whether you have just one free hour each day or if you are willing to work 40 to 50 hours a week on top of your full-time job, there are many options when it comes to learning how to earn extra income. Here are the reasons you need to earn extra income. You probably have the time. We all have extra time that we don’t use well. Everyone has the same 24 hours in a day. And, if you don't think you have the time to earn extra income, then you may want to think about how you are using your time. What you do with it is up to you, but you may be wasting time each day, and that can hold you back from reaching your goals. Now, not everyone wants to earn extra income. However, if you are in a bad financial situation or you are just not happy with the financial situation that you are in, then I highly recommend evaluating your time and finding ways to earn extra income. Did you know that the average person watches over 30 hours of TV a week? Even if you used just half of those hours finding things to do instead of watching TV, you could probably accomplish something great! Or, you may be wasting time because you are unorganized, procrastinating, and so on. Just think about it: What do you think you could do with an extra 5-10 hours, or even more, each week? This is all time that could be used towards finding ways to earn extra income! You can pay your debt off faster. Learning how to earn extra income can help you pay off your debt much more quickly than if you didn't earn extra income. For me, I found ways to earn extra income so that I could pay off my debt as quickly as possible. Earning extra income meant I was able to pay off my $40,000 in student loans in just 7 months. While you may not be able to pay off your debt this quickly (or maybe you'll pay it off in even less time! ), finding ways to make money can help pretty much everyone pay off their debt faster. And, while it may take a lot of hard work and dedication, you need to remember that you won't have to work such long hours forever. That small bit of pain means that you can enjoy a debt free life later. Debt motivated me to find ways to earn extra income. While I made a good salary at my day job, it wasn’t enough to let me live the life I wanted while paying off my debt. I didn’t want to be buried in debt forever, so paying it off soon was a big goal of mine. I realized the only way I could pay off my debt quickly was to build up my extra income streams. Earning extra income definitely helped with my debt goal. My side income streams allowed me to pay thousands of dollars extra each month. While that may seem impossible to you, I promise it isn’t. I have gotten many emails from people saying they too thought it was impossible, until they worked hard towards their side hustles. These are people who have paid off their debt fast due to finding ways to earn extra income. They all thought it was impossible but then they realized that they could do it too! Remember, even making just an extra $100 a month is $100 more than you originally had, and while this may seem like a small amount, it will make reaching financial freedom happen that much faster. You can reach your financial goals. Whatever your financial goal is, learning how to earn extra income can help you reach it sooner. Adding to a house down payment fund. By looking for ways to earn extra income, you may be able to reach your financial goals, such as the ones listed above, months or even years earlier. You can test out a business idea when making extra money. Are you wanting to build a side business so that you can eventually escape the 9-5? Or, perhaps you just want to make some extra income with a side business? If you are interested in starting a business, you might want to think about first starting it as a side business. This can be a great idea, because you can test the waters of your new business on the side while still having the stability and income from your full-time day job. You can see whether you like your business idea, whether it will truly work out, if you can make an income from it, test out different business ideas, and more. And, I know all about testing out a business idea on the side first. My side hustle (this blog) eventually turned into my full-time business. While I didn’t start my side jobs thinking that they would eventually turn into a business, it was a great way to start because I was able to keep my day job income and benefits while seeing if it would work. It took a lot of stress away by first having my blog as a side job instead of relying on it from the very beginning. Learn more at The Ultimate Guide To Starting A Side Business. Earning extra income can help you diversify your income streams. Do you ever feel too reliant on one source of income? Maybe you are afraid that one day you will lose your job or that something will happen to your main source of income. The beauty of finding ways to make extra money is that it allows you to diversify your income. This means you won’t have to worry as much about one of your income streams having a bad month or completely disappearing because you'll be prepared for it. By diversifying your income with multiple income streams, you will have a backup plan, you may be able to retire easier, and so on. Start a blog to earn extra income. The top thing I recommend doing to make money is to start a blog! Blogging is how I make a living, and just a few years ago I never thought it would be possible. In fact, before I started my blog, I didn’t even know that blogs existed! I currently earn around $100,000 a month with my blog. 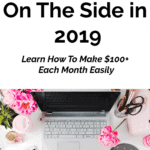 I also have a Free How To Start and Launch A Money-Making Blog Course that you can join, and it will help you start and launch a successful blog. 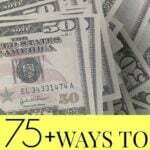 Here are 12 ways to earn money online. Sell on Amazon. If you want to find a good use of your time, then you may want to start an Amazon FBA business! Jessica Larrew, of The Selling Family, explains how selling on Amazon may be a possibility for you. She is a friend of mine, and I am blown away by her success! The first year that Jessica’s family ran their Amazon FBA business together, working less than 20 hours a week total, they made over 6 figures profit! If you are looking for a new job, or even just a side hustle, this may be something that you want to look into. Learn more at How To Work From Home Selling On Amazon FBA. Walk dogs and/or pet sit for extra money. If you love animals, then you may want to look into walking dogs or pet sitting. Rover is a great company to sign up with in order to become a dog walker and pet sitter. Learn more about this at Rover – A Great Way To Make Money And Play With Animals. Become a proofreader. In 2014, Caitlin made slightly over $43,000 as a freelance proofreader, while also going on several fun vacations. If you are looking for things to do instead of watching TV, this may be something to look into. Learn more at Make Money Proofreading By Becoming A Freelance Proofreader. Edit content to earn extra income. Websites, books, courses, and more all need editors! No matter how many times a person reads a piece of content, something usually slips through. If you’re a grammar-nut, then this can be a great way to make money. Become a photographer. Do you love photography? You might be able to earn extra income as a wedding photographer, portrait photographer, event photographer, and more. Learn more at How To Make $25,000 – $45,000 A Year As A New Photographer. Host a garage sale. A garage sale can be a great use of your time, because you can finally get rid of the extra stuff laying around your home as well as make some money! Answer surveys to earn extra income. Survey companies I recommend include Swagbucks, Survey Junkie, Clear Voice Surveys, VIP Voice, Product Report Card, Survey Club, ProOpinion, Pinecone Research, Opinion Outpost, Survey Spot, and Harris Poll Online. These survey companies are free to join and free to use! You get paid to answer surveys and to test products. It’s best to sign up for as many as you can, as that way you can receive the most surveys and make the most money. Become a bookkeeper. Ben, founder of Bookkeeper Business Academy, explains how becoming a bookkeeper may be a possibility for you. Ben helps people start and grow their own bookkeeping business with his online bookkeeping course. And, guess what? You don’t have to be an accountant or have any previous experience! This can be a great way to find something to do instead of watching TV. Learn how to earn extra income as a bookkeeper at Make Money At Home By Becoming A Bookkeeper. Become an Uber or Lyft driver. Spending your spare time driving others around can be a great way to earn extra income. Read more about this in my post How To Become An Uber Or Lyft Driver. Click here to join Uber and start making money ASAP. Mystery shop. If you’re looking for a fun way to earn extra income, then you may want to try mystery shopping. Yes, you can actually get paid to shop at stores and eat at restaurants! A few years ago, I mystery shopped a lot to earn extra income. I made anywhere from $150 to $200 a month mystery shopping and received free meals, makeup, and more. I only used Bestmark for mystery shopping, so I know that they are a 100% legitimate company. There are other legitimate mystery shopping companies that exist, but you do want to do your research. Are you interested in learning how to earn extra income? How could doing so change your life? 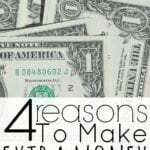 4 Reasons To Make Extra Money – It Changed My Life And It Can Change Yours Too! I feel like there are so many options these days to make money online if you’re willing to put in the time and have a stable internet connection. I feel like it’s almost a must to have multiple streams of income to diversify your portfolio in case something bad happens from your main stream of income. Great post like always!!! Excellent ideas for earning extra income, Michelle. That’s exactly why I started my blog — to bring in extra income for the family. I pray it turns into full-time income so I can leave the day job. But, for now, I’m just working on building it up to provide a steady extra income for the family. Thanks for sharing! This is a great post! 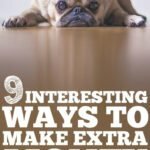 There are tons of ways to earn extra change if you are willing to take the time. I’m curious about mystery shopping. Heard it can be fun if you get the right company. Couldn’t agree more!! I would add that extra income streams are vitally important for protecting yourself from job loss. When Rick was laid off in 2010, his job was our only source of income as I was home with four small kids. Today we have multiple streams of income, and a job loss wouldn’t affect us nearly as heavily as it did back then because we’ve got other ways we’re making cash. I’m leaving my full-time job this week to early retire at age 50 – but all I know is “work” (I’ve worked since I was 13 doing something!) I’ll continue to do a few part-time jobs (online for the most part) and when I choose. I am a huge believer in multiple income streams. We have rental property, pensions, online work, and we can now choose any other work that we enjoy to supplement and build our net worth. We are hoping to leave a legacy to our kids and their kids. Not millions and millions, but enough to help support them. I started my blog as a way to store what I’ve learned about finances in one place where hopefully others can use the information as well, and I’ve just started looking into ways of earning some side income through it. I love having things to do, so I think side hustling works for me. The only idea I’m skeptical of are surveys because the payout-for-time trade off can be low (maybe I’m just slow at surveys). Great post! Great piece Michelle. I remember there was one article that discussed the normalisation of poverty (that we would need to hustle on the side in order to make end’s meet.) But there are different situations and circumstances than just that. I choose to generate more than one income mostly because of # which is simply I have more time than others thanks to my line of work! I think your first point my be the most valuable for others. Everyone has extra time that they choose to use otherwise. Until you make the commitment and actually want to start making money online or doing any kind of side hustle it won’t happen. Ditching our cable company literally changed our life. Everyone has time. The benefits from having multiple sources of income are endless. Good job! I’m so glad we got rid of cable as well. Being able to throw an extra $100 a month towards your debt can make a huge difference. 100% of this payment will go towards principle. Earning even a little bit of money on top of your regular job can be a great way to pay down debt. Side gigs that are online are great due to their flexibility but even a second part time job will do the trick. Yes, that extra $100 can go a long way. I’m currently able to rake in a decent amount of money each month doing freelance writing through UpWork. I don’t spend too much time on it, actually, and I’m able to bring in $200 on a good month. 🙂 If you have the surplus of time, it’s totally worth it. So true that we all fritter away time. Just the hours spent watching TV could earn you some extra money doing surveys online or earning $12/hour as a virtual assistant. When people say “I can’t” and “I don’t have time” they should hold themselves accountable because those statements are nonsense — if you really WANT something. We have felt the pressure of losing our only income and scrambling to find a new job. I really don’t want that to happen again! I’m becoming more and more convinced that it’s so important to have multiple income streams. Or at least to be developing skills and hobbies that could be turned into income if needed. These are great reasons and this is also the reason I want to do some pro bono work as an attorney. Multiple streams of income is important. I plan to use the income from my websites to help those in need and do some pro bono work. How long did it take you to have multiple streams of income? Online multiple streams that is? Was it hard to juggle it all? And it’s so simple, as you say anyone of us has 24 hours. Your first point is spot on about finding time. I’m working to beat my smartphone addiction currently. Smartphones have kind of become the new TV. People might be cable cutting but they are spending 3 hours a day on their phone. I know I was shocked how much time I was wasting once I started tracking my time. It is just amazing how much great content you have on your blog about making money online. Thank you! Smart phone addiction is such a tough one! If you find any tips – we’d love to hear it. One thing I’ve been trying to do when starting a task is turning it completely off. I once read anything within 20 seconds will be harder to avoid, but if you make an action take longer, you can more easily say no. Another option is to use an auto-reply message – this gives me some peace of mind when I get a new text, knowing that the auto response says to call in an emergency. I’m glad you brought up this topic about creating and establishing multiple income streams. I always tell people it’s a good idea to join multiple affiliate networks before and after starting a WordPress business blog and building it from the ground floor up. The reason being for joining multiple affiliate networks is not to rely on one single affiliate network to put all of your eggs in. And not all advertisers partner with multiple affiliate networks. So this is also why it’s good for affiliates to sign up as a publisher on multiple affiliate marketing websites because they may desire to work with a certain brand name advertiser. I have great respect for you for always writing about ways to help others earn more money online like you’re doing in affiliate marketing and blogging. The real reason why people believe this line of work is impossible because they’re unfamiliar with this way of thinking. People who assume this line of work is possible never stepped outside of their comfort zone. They have their cushy jobs and content getting up in the morning and going to work 30 to 40 years and working there miserable positions. Little do they know if they changed their way of seeing things and create a side hustle online such as starting a blog and working on it as side hustle instead of relying on their 9 to 5 day job and looking at people every day they allegedly can’t stand, they’ll be able to disconnect themselves in due time from corporate rat race and benefit from something like you mentioned called “financial freedom.” I have to admit that this line of work does test a person’s faith see what they’re made of as a true entrepreneur because it tested mine. And I’m humble enough to say I failed for many, many years. You have to want to do this because no one’s going to stand over top of you pressuring you to meet an online monthly sales quota through affiliate marketing and blogging. I commend you greatly for paying off $40,000 in debt as little as seven months. I’m curious to know were you sitting at your computer blogging every day for 10 to 20 hours daily? I mean, was there allegedly days you took off from your day job just to build up your blog and do nothing more than that? Bo earn that kind of money in 7 months time and go from $40k to $0 debt-free means you put in serious work. And if you did work extensive hours during the day Michelle, how many hours per day did you work on your blog? I actually just wrote a semi-contradictory article today about why earning more money isn’t always the right answer. Love the ideas you listed too! We have the same amount of time, different priorities. That’s life and there is nothing wrong with it, once you decide that you get to determine your priorities and make decisions that align with them based on your time, then you no longer need to say you were busy or don’t have time, only that you had higher priorities at that time ! Often times I think, hey, I used to do a lot more with my time a decade ago! I had 2 blogs I earned passive income from, was active on dozens of forums and at the same time, had a job and school to finish. Procrastination wasn’t that big of a problem back then. Many say time flies by quicker when you’re an adult, but I’m pretty sure that’s not the case. Like you said we each have the same number of hours in a day. Love this so much! This is why I make money blogging – to pay off my student loans from law school! I completely agree with this. I think a lot of times people have a psychological barrier when it comes to making money. Especially for people like me that came from a lower socio-economic background. There seems to be a general acceptance of debt or just a lower income, in general, that it’s just going to be there and you just need to accept it. I actually have accepted that too for the longest time until I moved to a bigger city (Austin, TX) and have seen people not only do incredibly well financially but they treated money as a tool versus just paying basic bills and just don’t worry about everything else. That’s one of the reasons why I was so inspired to start my own blog. *Side note* I read the average millionaire has 7 different streams of income. I’m totally jumping on that millionaire train! Lol. Wow! Seven different streams of income! That is amazing. I did not know that about the average millionaire. I wouldn’t have been able to pay off my debt in a timely fashion without the extra gigs I picked up to make extra money. It’s so worth it! Also, having a side hustle is an amazing thing for when you don’t yet have a fully funded emergency fund. Most people look at the recommended 3-6 months of expenses guideline and they get overwhelmed. Having a side hustle really helps relieve some of the tension. And it gets you to your emergency fund goals faster! I’m trying to set up multiple streams of income, but sometimes it feels really tough. That being said, I think it’s important to recognize and adjust/eliminate the “side gigs” that aren’t working well! I did mystery shopping years ago and earned quite a lot (well over $1,000 per month). It was a great income supplement and I enjoyed heaps of freebies and great meals in turn. How much do these extra jobs pay per hour? I earn $50 per hour as a MCAT/SAT/ACT tutor, in addition to my day job. My job is really easy, and I kind of like it. I wonder if these jobs will pay more? Should I look into alternative jobs? Depending on a single source of income is not a good idea. Everyone should spend their time and effort to learn something new and start earning from it. Love the idea of starting a side business while you work and then eventually and hopefully turning it into a full-time business. It is extremely difficult to quit your job and go straight into a new business. So starting to work before on the business could be huge. This is an especially good idea for starting a blog 🙂 Thanks for the great ideas! Its unfortunate that society mainly teaches people to spend many many years on education, to get a job that they work in for many many many years. The concept of multiple incomes is often associated with instability, risk & lack of focus. I argue that its the opposite as having a single income is quite risky and is no longer is stable. This post is a good reminder of the benefits of multiple incomes and also the increasing ability to have multiple incomes in this ‘Gig’ economy. how about my site is it good?